Palestinian Diplomat Was Not Killed By Booby Trap, Police Say : The Two-Way The Palestinian ambassador to the Czech Republic died Jan. 1 at his residence in Prague. At first, investigators thought an old safe might have exploded. Now, they say that wasn't the case. 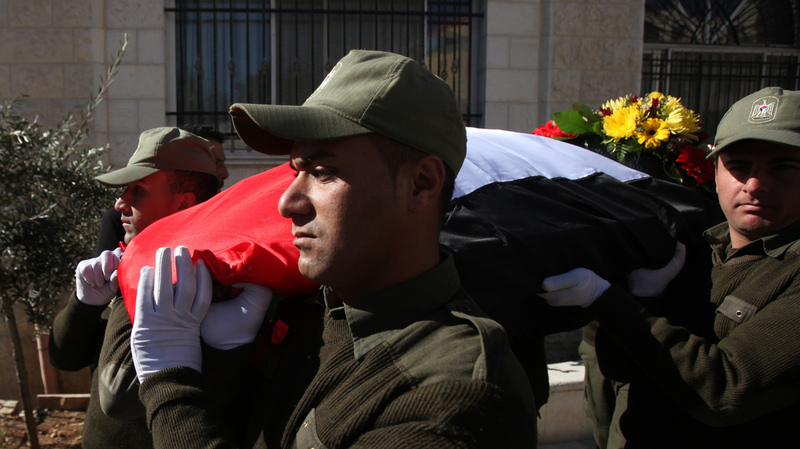 Jan. 8: Palestinian security guards carry the flag-covered body of Jamal al-Jamal, ambassador to the Czech Republic, during his funeral in the West Bank city of Ramallah. The circumstances of Jamal al-Jamal's death remain a mystery, but police in Prague say they've ruled out one cause. Jamal, the Palestinian ambassador to the Czech Republic, was not killed on Jan. 1 by a blast set off when he opened a safe at his residence, Prague police announced Monday. The security system on the safe and the possibility that it was booby-trapped to thwart tampering had been the early focus of the investigation into his death. But now, police say the safe was not rigged with explosives. Radio Prague reports that a local news outlet says police believe Jamal may have been holding whatever it was that exploded. Prague police are still saying they do not suspect foul play of any kind. Instead, the Prague Post writes that the investigators think it may have been a case of death "caused by negligence." That raises the possibility that the ambassador was handling something that mistakenly went off. The Post points out that since Jamal's death, Czech police have seized 12 unregistered firearms that were found in the embassy: "The weapons were gifts from representatives of the then communist Czechoslovakia, Palestinians said in a statement sent to the Prague police."